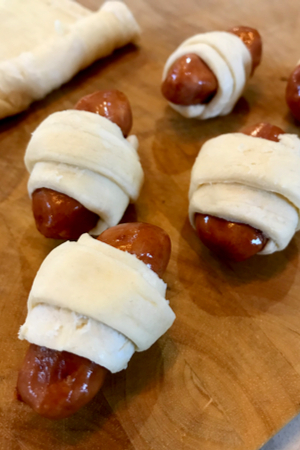 You can’t get a much easier-to-make appetizer than this Little Red Smokies Mini Pigs In A Blanket recipe. It only requires two simple ingredients: Little Red Smokies and refrigerated crescent roll dough. A tray of mini pigs in a blanket served ready for the party. In under 20 minutes, your appetizer is ready to serve! There is a lot of history behind the development of the traditional pigs in a blanket recipe. In the U.K. little sausages that are wrapped in bacon are referred to as pigs in a blanket. However in the United States, pastries are the preferred ‘blanket’. Whether it be croissants, biscuits or crescent roll dough, hot dogs or sausages are wrapped in the dough and baked in the oven. The preferred method in the US is to wrap the ‘pigs’ in pastry dough such as crescent rolls. The full size versions are typically made with hot dogs and are a favorite among kids. However, if you are looking for a quick and easy appetizers for adults, the Little Red Smokies pig in a blanket are the answer. Little Red Smokies are actually a name brand for small smoked sausages. You will see them referred to as Lil Smokies, Li’l Smoked Sausages, and Lit’l Red Smokies. No matter the name, they are mini smoked sausages that typically come in a vacuum sealed pouch. Little red smokies are smoked sausages that are sold by several different names. 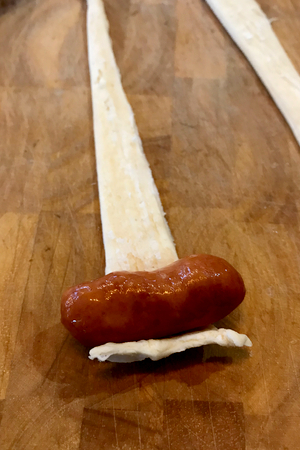 Although you can now purchase mini hot dogs, the small sausages are preferred for this recipe. The sausages provide much more flavor than hot dogs and are the preferred center of pigs in a blanket for adults. However, if you are making them for a kids party or snack, then either would be fine. You can find the Little Red Smokies in the grocery section near the bacon. They are typically can be found on the bottom shelf in the refrigerated aisle. And as for the crescent rolls, any brand, or off-brand, is okay to use. Using a pizza cutter makes it easy to cut one large triangle into three pieces. 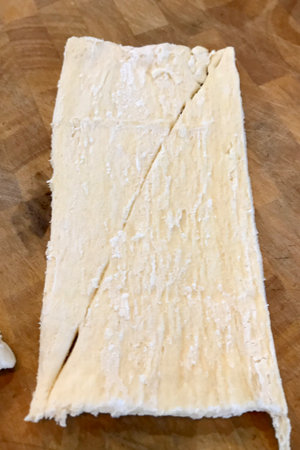 The key to the crescent roll dough is to keep it cold until you are ready to work with the dough. Once it warms up to room temperature, it becomes sticky and difficult to work with. So if you are making a double batch, keep the second roll of the crescent dough in the refrigerator until ready to use. 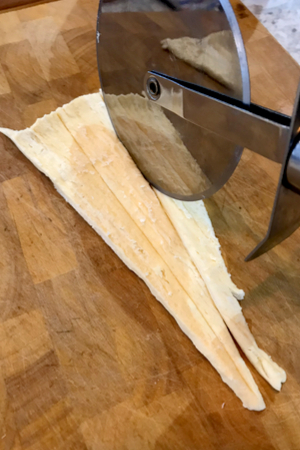 Some recipes will instruct you to to pinch the seams of two triangles together and make cuts both lengthwise and crosswise to make the strips of dough. This results in the dough being wrapped around the sausage in a mummy like fashion. 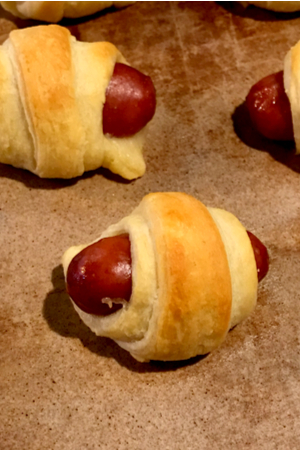 Wrap each sausage in a crescent roll fashion. Although there is no difference in taste, I think it looks much better to have the dough wrapped around in the traditional crescent roll shape. It is a much more appealing ‘blanket’ looking fluffy and inviting. In order to get this look you will need to cut each crescent roll triangle into 3 mini triangles. I find it much easier to start at the small pointed end and score the triangle into three equal parts. My pizza cutter makes this process a breeze! Starting at the wide end of each mini triangle, place the mini sausage on top of the dough. Once the dough is nice and golden brown, remove from the oven and serve warm! Roll the dough to the opposite end and place seam side down on an ungreased baking sheet. 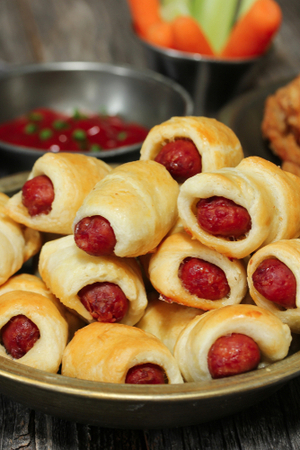 Within 15 minutes, your little red smokies mini pigs in a blanket are ready to be served! 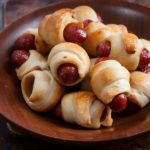 Little Red Smoked sausages wrapped and cooked in crescent roll dough to make the perfect hand held appetizer. Unroll the can of the crescent roll dough and separate into 8 triangles. Starting at the pointed end, cut each triangle lengthwise into 3 narrow triangles of equal size. Place sausage on largest side of the triangle. Roll the sausage and dough to the opposite point and place point side down on an ungreased cookie sheet. Immediately remove each pig in a blanket from cookie sheet and serve warm. Serve with dipping sauces such as mustard, ketchup, and ranch dressing.